KOI MEDICATING: Healthy koi ponds require proper pond care. 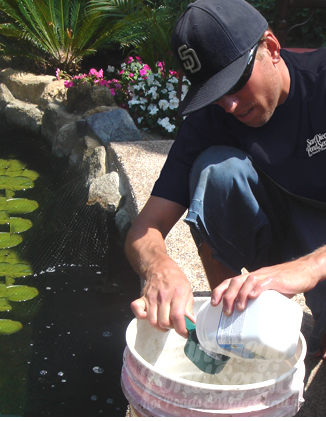 Keeping your pond water healthy is the key to happy, healthy koi. Koi medicating can be extremely difficult. There are no guarantees your sick koi will recover from it’s illness, even after treatment. A successful treatment may work for one koi, but not for another. Individual koi breeds handle medications differently. Our best advice is to first always maintain healthy water conditions and to always keep a close eye on your koi’s behavior. Early detection, means early treatment, resulting in a higher recovery rate. One sick fish could potentially wipe out your entire koi population. LESIONS: Wounds, punctures, growths, erosions, ulcers, or even heavy slime or mucous coats are obvious signs of illness. Open wounds are an invite for parasites or bacterial and fungal infections. FLASHING: Flashing or rubbing is often associated with a change in water chemistry. But if the flashing continues even though your water conditions are ideal, this may be a sign of parasites such as flukes, anchor worms, or fish lice. LOSS OF APPETITE: If all your fish are eating normally except for one, there’s a chance that particular fish is ill. SWIMMING BEHAVIOR: Koi slowly swimming nose down, tail up, not swimming all, or huddling in certain areas of the pond are signs of stress and possible sickness. ADDING MEDICINE: Be sure to measure out the dosages. DO NOT OVERDOSE!!! Koi are extremely sensitive! Overmedicating or improper treatment can easily result in koi fish loss! 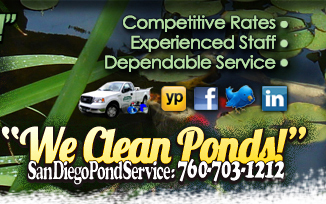 For koi's sake, let SDPS care for your sick koi!